number14 many thanks for your investigation of the white plug. to provide power for aux light/ sat Nav on a friend's bike today. I used a female pin from a Tamiya connector to slide into the plug male. Thanks for the information everyone - just the job for my power needs. Btw I found this UK supplier that can offer all the components separately including blanking bungs, and black wire inserts that should be a good size for most bike accessory wires. Looks like they only offer grey male plugs however I’ll be swopping back to the factory fit white plug when I sell the bike so not bothered. Methinks this poster has got it right, and I suspect this connector block is for turn-by-turn navigation using Google. I've used the connector block for my TomTom, and therefore it doesn't bother me, as I doubt I'll ever use the Triumph/Google navigation. I'd rather have a proper sat nav than the weak turn-by-turn setup. And to use the Triumph/Google navigation, you'll need a software upgrade (free) and a dongle - price to be announced. 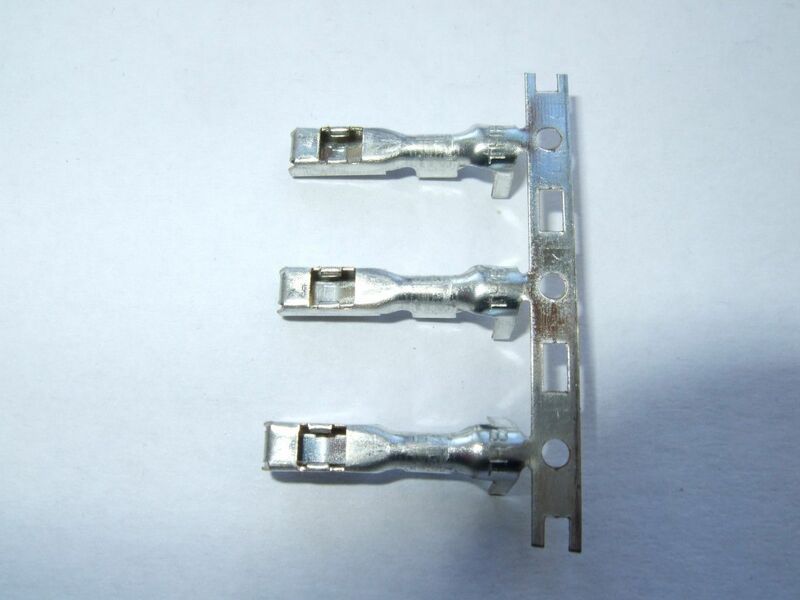 I ended up buying these connectors from eBay - item number 282103009944. The holes in the seals were far too large (blue), but fortunately I had some smaller seals (green). If you need the smaller seals, then it may be worth contacting the seller. 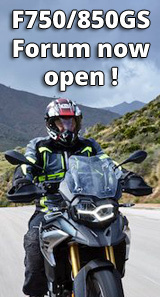 My sat nav (TomTom Rider 450) now switches on with the ignition. When fitting the female pins into the plastic connector are they polarised so that they only be fitted one way? Also what is the locking mechanism for the pins into the connector as I do not see any 'barbs' that latch but then allow you to remove the pins later? Don't want to start pushing any pins in without knowing the right way they go or that you can remove them if you screw it up? This is the underside of the terminals, and you can see the cut-outs to house the barb. When installing, don't forget to place the seals on the wire before crimping. I take it that the pins can only go in one way then and once fitted will not be easily removed afterwards? The orange seals supplied with my connector kit are far too large to seal against the TomTom lead itself, but will probably compress within the cable tags on the end of the pins. Do not see that a water tight seal is necessary but will press some silicon grease into the ends of the connector to seal the ends for good measure. Thanks #14, really helpful post! Got the plug from electrodart.co.uk, got the wire from the GPS to the back of the bike (a bit of trial and error) but works like a charm! There isn't an alarm connected. The alarm connection block is at the bottom of the screen with it's feedback loop intact. The USB connector is at the top of the image. 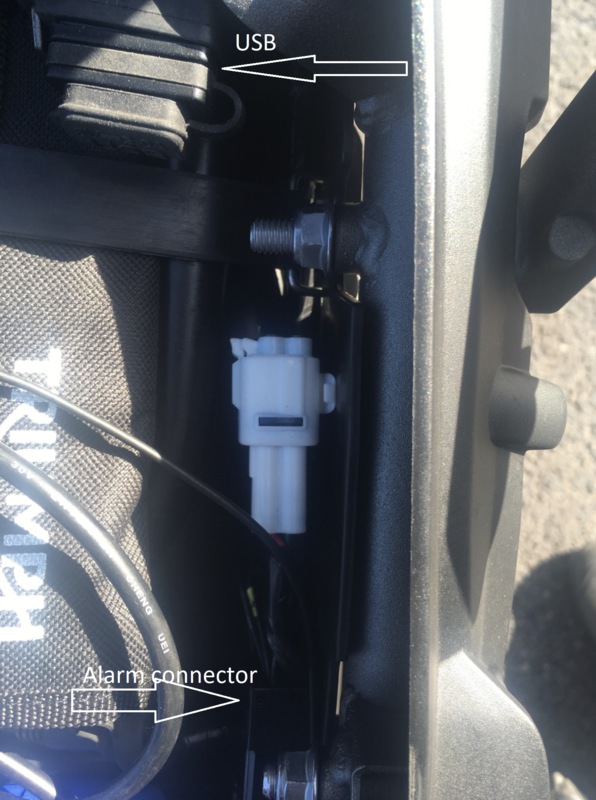 The white plug comes from the same harness as the alarm connector but doesn't go anywhere. I can't test for power as I don't have a multimeter so cant check if it's live with or without ignition or engine running. BETTER than a multimeter: there are a number of inexpensive “probe” type go/no-go lightbulb testers. Alligator clip to one side (usually N) and probe point to locate live points. These run about 6-8 inches. I have a 12v bulb that came with 2 leads (Radio Shack) a bit short but hey I can always add another length. If you can’t find it go for the smallest 12 or even 24 v INCANDESCENT bulb WITH a pigtail socket. Pull the leads through the top of a small Rx vial and screw the bottle over it - Voila. I just pulled ignition controlled Pos from the Green wire going into the white “Alarm Connector” sent it through a 3Amp ATM in-line fuse holder to actuate a power relay for my add-on toys. 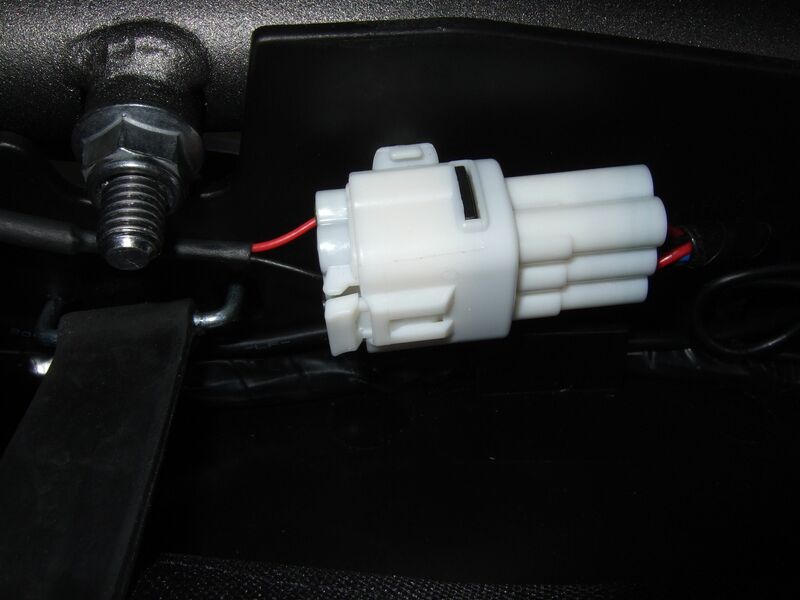 I used a 6 position ATM Fuse Block with a clear snap cover - which BTW I wound up having to relocate loosely under the front/rear seats crossbrace because there just wasn’t enough room anywhere else. Plan to possibly revise circuit fuse-block to inline fuse holders, which will be so much easier to lay in the cavity, with next electrical project probably Saddleman seat heaters.